Hey Divi Nation! 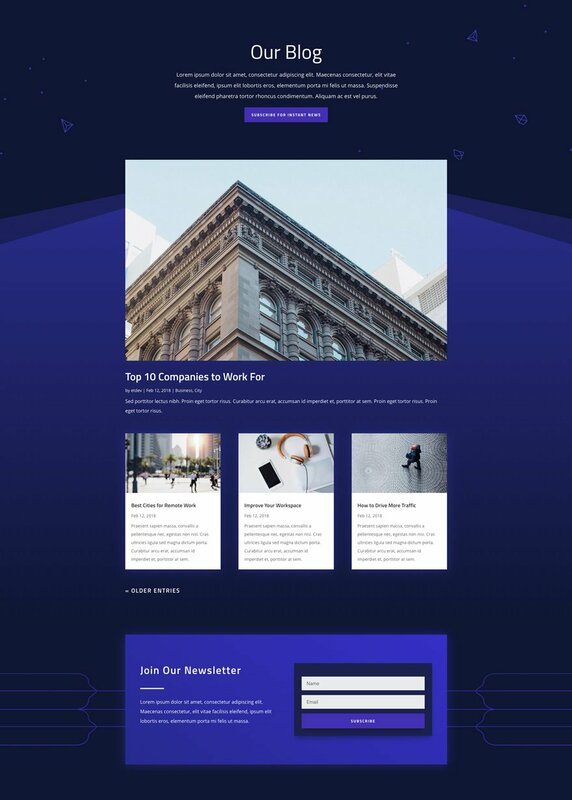 Thanks for joining us for the next installment of our Divi Design Initiative; where each week, we give two brand new, free Divi Layout Packs from our design team to you. 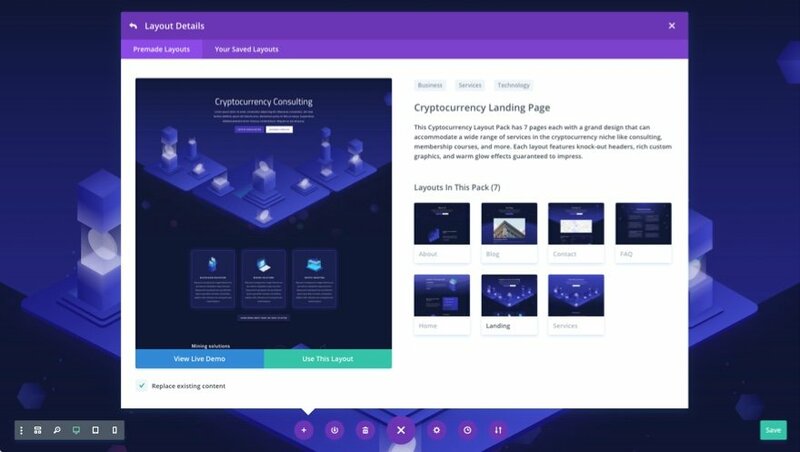 For the first layout this week, Kenny and his team have created a free Cryptocurrency Layout Pack. This pack has 7 pages each with a grand design that can accommodate a wide range of services in the cryptocurrency niche like consulting, membership courses, and more. And the design of each page features knock-out headers, rich custom graphics, and warm glow effects guaranteed to impress. You will definitely enjoy the unique features of this layout. The custom graphics and icons are stunning, providing valuable assets to your design toolbox. The subtle use of lines as background images are unique. Modules throughout have a warm subtle glow to make them standout. This is best demonstrated by the email subscription form on the Landing page. And I especially love the use of lines on the about page to divide content and draw the user down the page. To access your new layout, simply activate the Visual Builder when editing a page and look for the “Load From Library” icon in the page settings bar (it looks like a plus symbol). Click this icon to launch the Load From Library popup. Under the Premade Layouts tab, you can easily find the new layout by scrolling through the list of layout packs. Once you find the Cryptocurrency Layout Pack, click on it. You will see all the individual layouts included in the pack. Select the layout you want for to use and then click the “Use This Layout” button. WAIT???? This one came out a couple weeks ago right??? Where do you(ET) get all your graphics/illustrations(not photos)? Can anyone recommend a good yet affordable stock image service? All the added images / illustrations you guys have been putting out over the last few months is such a huge bonus. Thanks! Hopefully you can update, and then this would be 100%! Also, who’s your designer on these? As all of this is free anyway, can we have all the image in a Image Pack Library so we can look for and grab the same way we do layouts today? This is indeed part of our longer term plan. It’s just not something we can create and release immediately. Don’t worry, we won’t forget about it. Here is what I suggest….Hire a different DESIGNER to get some different base designs. How about making some conversion based designs? Brilliant. Thanks. Will this work on the Extra Theme as well, or just on DIVI? These layouts have been incredible! Yet, we are still “craving” for an amazing Blog layout that is different. Other that, appreciate the work. These layouts have been incredible! no question about that. Yet, we are still ”Craving!” for a different BLOG layout, that would come sooo handy for those of us who have a particular bloggy site othen than an informational or static. Thanks for the efforts on this. wow.!!! that post just made my Day.!! That is just amazing, The graphics and images are so cool.!! beginners like me loves this. ¿Why all your designs are the same? Genuine question. How are they the same? Fabulous layout on a really unbeatable theme platform. Well done to the Divi team! Very modern look to this design. 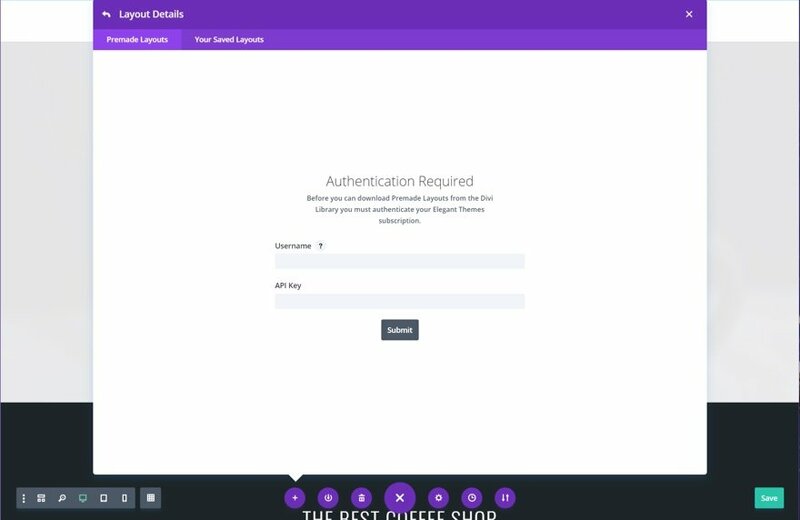 Elegant themes has accomplished so much with DIVI. After a decade of web design, DIVI is now critical to my business model. And now a theme that is everything crypto currency? 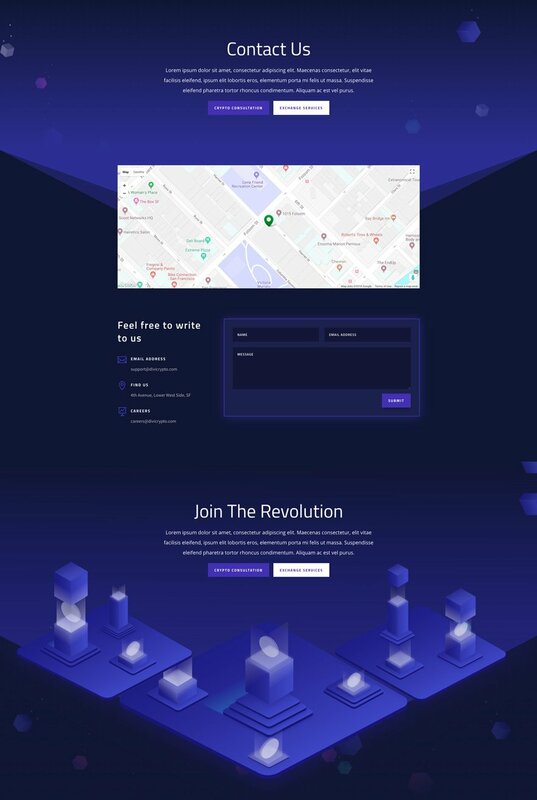 Regardless of what currency, Bitcoin, Ethereum, Zcash, Ripple, Moner, this is THE theme for CryptoCurrency design solutions. You guys are truly amazing. Thank you! Amazing, I really like the design! Good layout. Appreciated the “.psd” files for customizing the examples. Is it possible to add the “.psd” files of the complete layout designs page by page? That would be great. Thank you very much. Great job.